On the afternoon of April 12, 1945, Vice President Harry Truman sat in the Capitol office of House Speaker Sam Rayburn sipping whiskey and talking politics. The conversation was interrupted by a phone call summoning Truman to the White House. Roosevelt's second-floor study where the first lady waited. "Harry, the President is dead," she declared as he entered the room. Stunned, Truman responded "Is there anything we can do for you?" She replied, "Is there anything we can do for you, you're the one in trouble now." 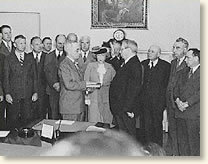 That evening, around 7 o'clock, Truman was sworn in as President. He later remarked to reporters "Boys, if you ever pray, pray for me now. I don't know if you fellows ever had a load of hay fall on you, but when they told me yesterday what had happened, I felt like the moon, the stars and all the planets had fallen on me." 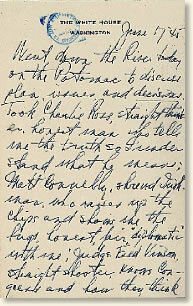 understand what he means; Matt Donnelly, shrewd Irishman who raises up the chips and shows me the bugs, honest, fair,'diplomatic' with me; Judge Fred Vinson, straight shooter, knows Congress and how they think, a man to trust, Judge Rosenman, one of the best in Washington, keen mind, a lucid pen, a loyal Roosevelt man and an equally loyal Truman man; Steve Early, a keen observer, political and other wise, has acted as my hatchet man, absolutely loyal and trustworthy, same can be said as about Rosenman. We discussed public relations in Germany, Italy, France, Holland, Belgium, England and Russia. Food, fuel, transportation and what to do about it. Japanese War and the relations with China, Russia and Britain with regard to it, Supreme Commander and what to do with Mr. Prima Donna, Brass hat, Five Star McArthur [Truman misspelled MacArthur's name]. He's worse than the Cabots and the Lodges - they at least talked with one another before they told God what to do. Mc tells God right off. It is a very great pity we have to have Stuffed Shirts like that in key positions. I don't see why in Hell Roosevelt didn't order Wainwright home and let McArthur be a martyr, guess he was afraid of the Sabatoge Press - McCormick - Patterson Axis. We'd have had a real general and a fighting man if we had Wainwright and not a play actor and a bunco man such as we have now. Don't see how a country can produce such men as Robert E. Lee, John Pershing, Eisenhower, Bradley and at the same time produce Custers, Pattons and McArthurs. I have to decide Japanese strategy - shall we invade Japan proper or shall we bomb and blockade? That is my hardest decision to date. But I'll make it when I have all the facts. So you see we talk about more than 'Cabbages & Kings and Sealing wax and things' They talked of many things Shoes and sealing wax and cabbages and kings." McCullough, David G., Truman (1993). "Thoughts Of A President, 1945," EyeWitness to History www.eyewitnesstohistory.com (1999). In 1942, General Jonathan Wainwright assumed command of the American forces in the Phillipines after General MacArthur escaped to Australia. Wainwright surrendered his forces to the Japanese on May 6. He became a prisoner of war and was rescued from a Japanese camp in Manchuria in August 1945.